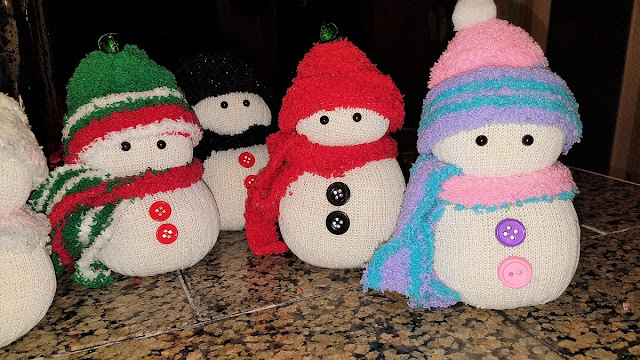 Adorable Snowmen - made from Dollar Store socks! 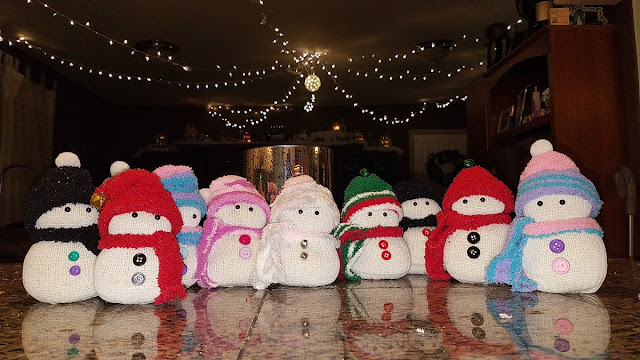 Well there have been many recipes and crafts on the back burner that I need to share with you as the holidays approach at top speed, but I thought I'd start with some of the cutest little snow people that we made as gifts for teachers and family members over the holidays last year. They were so fun we made them this year as well. No-sew snowmen made out of dollar store socks! 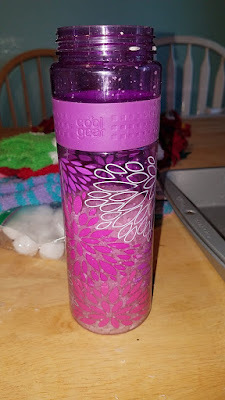 The best part about this craft is, that it's great for adults and kids alike. I had just as much fun making these (if not more) than the girls did. 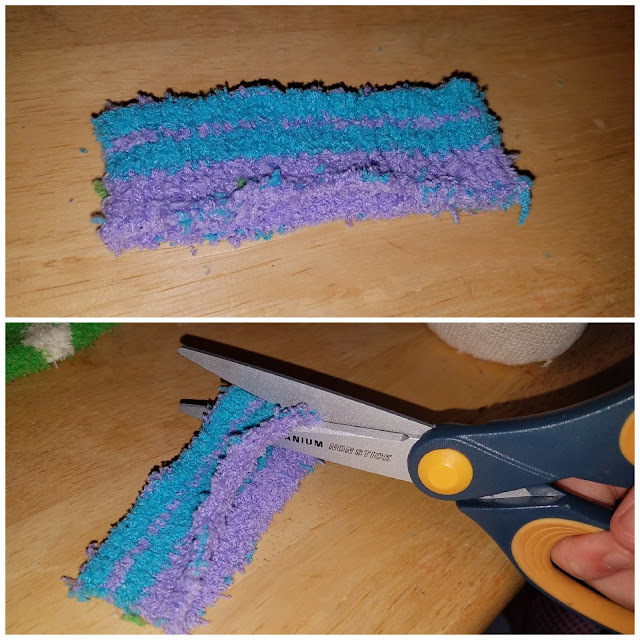 The other awesome aspect to this craft, is that it only requires a few simple items from the dollar tree, a few other craft supplies, and no sewing! 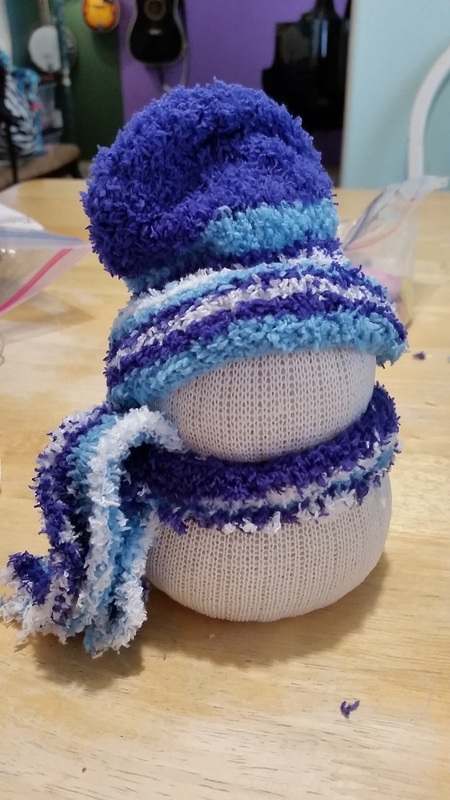 Snowman made from socks, customize one for every style and taste. Note: You can also use "lost" socks at your house that you can't find the pair for. Take out one men's sock. The part you are going to use is not the foot part, but the section that would go up the leg with the ribbing. With sharp scissors, cut about 1 inch past the end of the ribbing, close to the start of the heel. Place the toe part of the sock aside. 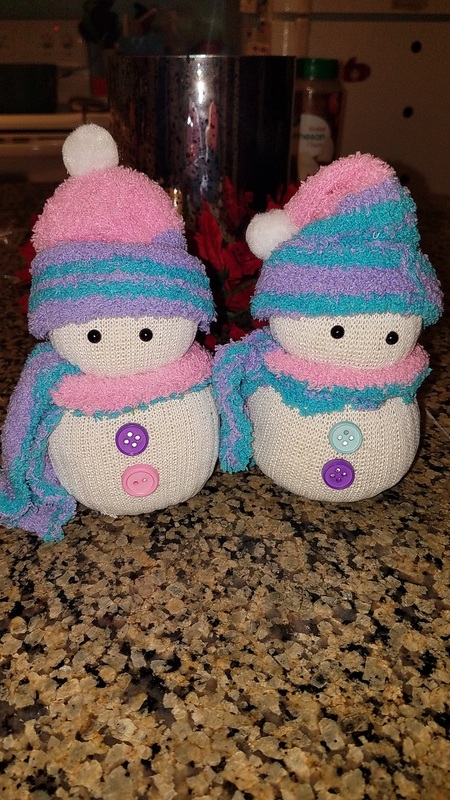 Each two pack of men's socks will make 2 snowmen. Turn the sock inside out and gather the thickest end into a tight "flower" pinching together the ends and put a rubber band around the top several times to secure. Turn the sock right side out again, with the rubber band end tucked inside. Fill a tall cup with uncooked rice. 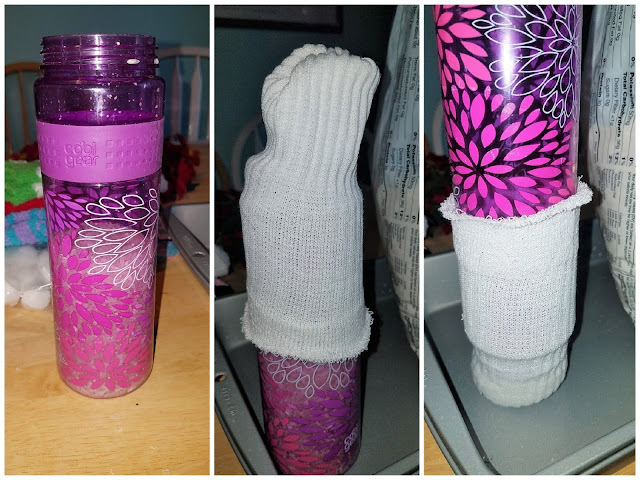 We found that this tall water bottle was narrow and the perfect size to slide a sock over. A thin, tall travel coffee mug would work as well. 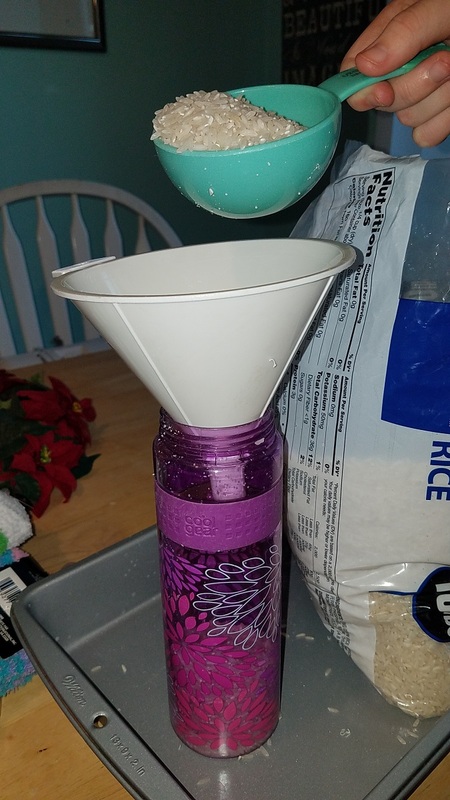 We used a funnel to help the rice go into the right place. Oh we also used a 9x13 pan under all the rice activity to help keep rice from flying all over the kitchen. Place the open end of the sock over the top of the cup and gently flip over. 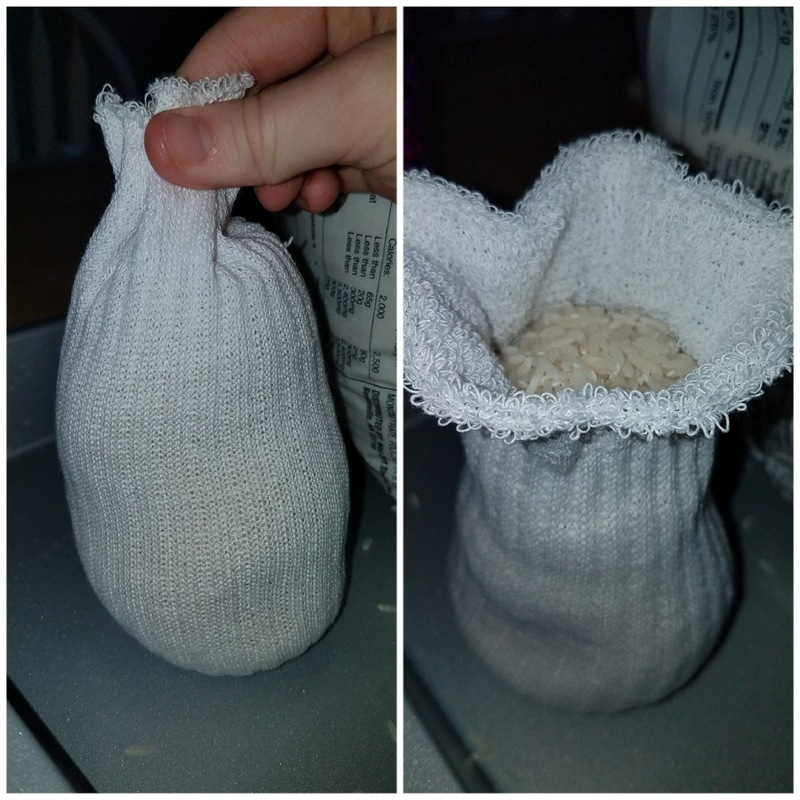 Carefully let the rice start filling up the sock. It will look like there is too much rice, but if you push the bottom of the sock down a few times as it is filling, it will stretch/widen out and more rice will fit. 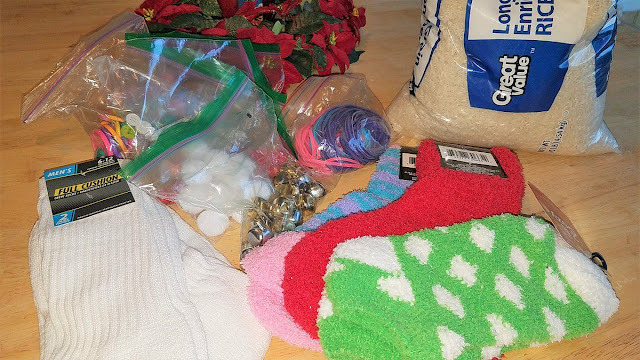 You don't want to overfill the sock, because rice will start to come out the stretched out holes. At the very end, carefully remove the cup without letting the rice fly all over the place. There should be about an inch of sock material at the end. Leave enough to gather together. 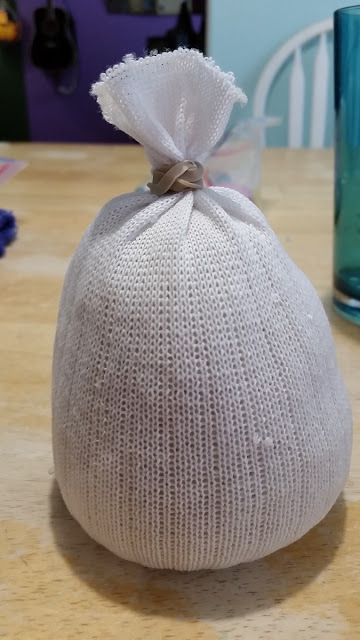 Once the sock is full of rice, it is quite mold-able to the shape you want. 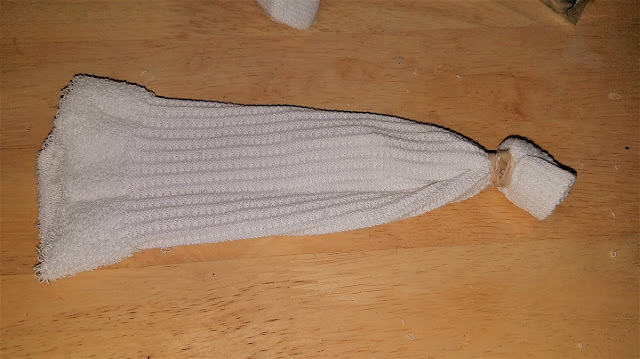 Push the sock down again until you can gather enough material at the top to cinch another rubber band in place. 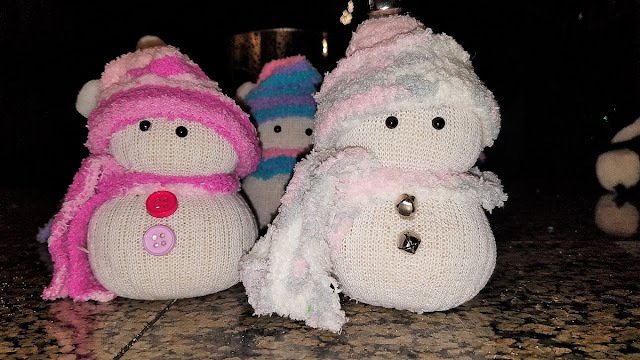 Your snowman project will look a little fat and flabby at this point. 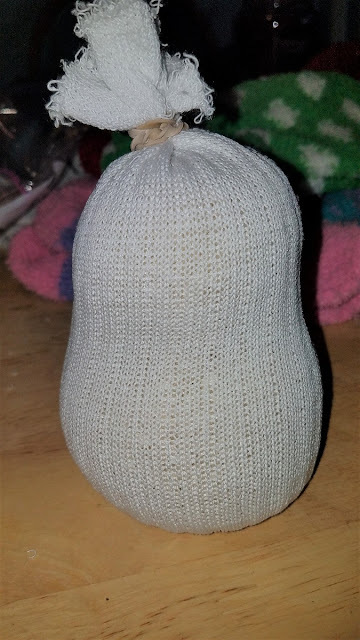 At first the shape should look like a pear, with a wide bottom, going up to a narrow top. 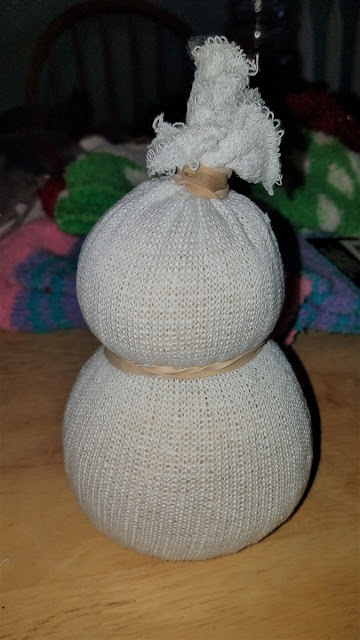 Now you can shape the "head" of the snowman by squeezing in slightly above center to form two "balls". Place a rubber band around the head (this will be hidden by the "scarf" later on), and the Mohawk at the top will be covered up by the hat. Now the fun part, to make the scarf and hat from the fluffy fuzzy socks. Pick out one you like and you are going to make a few cuts. Start at the tip of the toe and measure up 4-5 inches, before the heel and cut across. This will be your little hat. 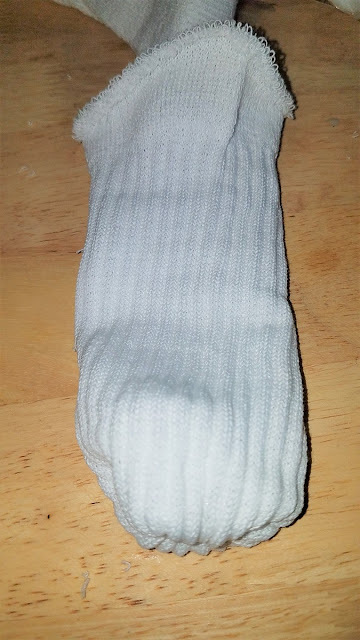 You will get four pieces out of one sock. 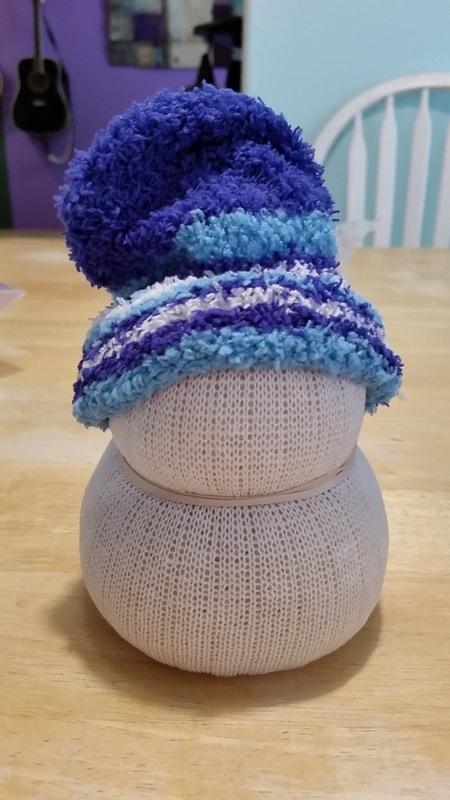 The hat from the toe, the neck piece (part of the scarf) from the top of the sock, and then a scarf tie to make the scarf more realistic looking right below the neck section, and then there will be an extra piece you don't need made up of the heel area. 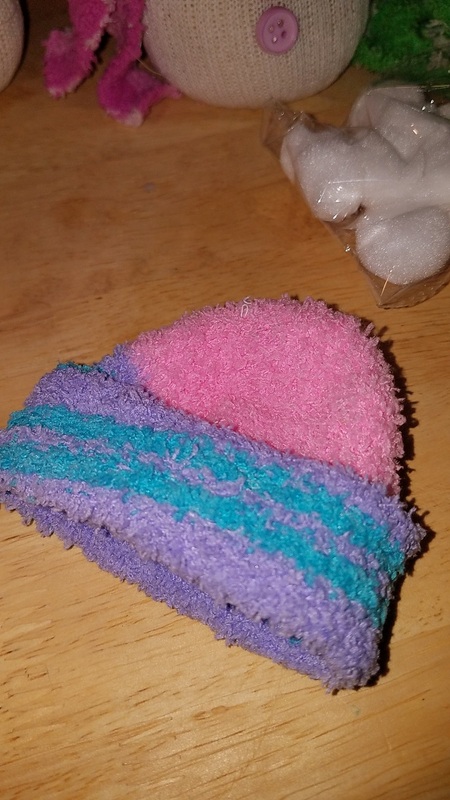 Take the toe part of your sock and flip over a bit of the bottom to form a brim (fuzzy socks have a lot of fluff, we pulled off a few fuzz balls as we went to make them look neater). Now you have a cute little hat for your snowperson. Find the cutest "face-looking" side of your head and pull the hat down over the top to see how it fits. Adjust the width of the brim if necessary. This little guy is from the first year we made these. Now for the scarf. 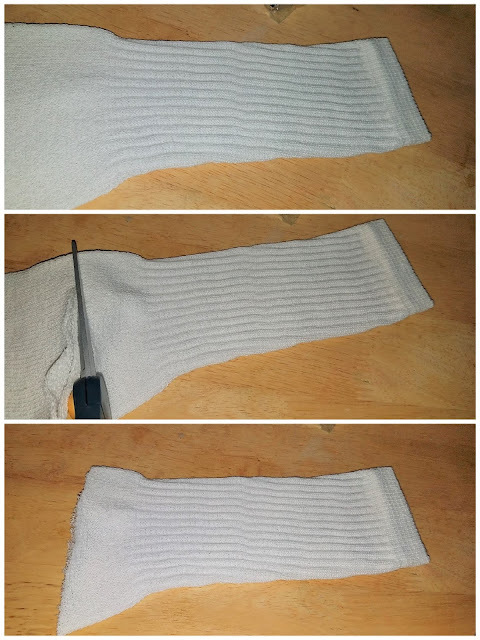 Take the end of the sock where the elastic is, and cut a strip at the top there about an inch wide. 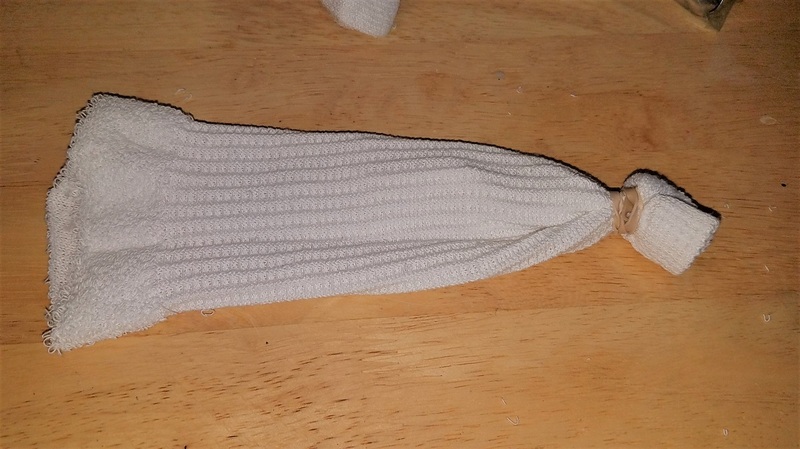 The "neck" part is at the very top of the sock. 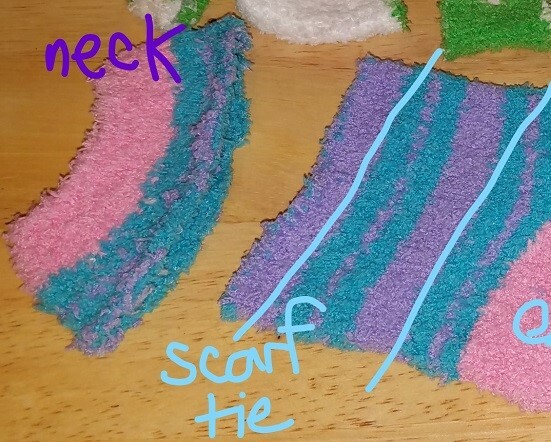 This will be the scarf that goes around the neck and hides the rubber band. 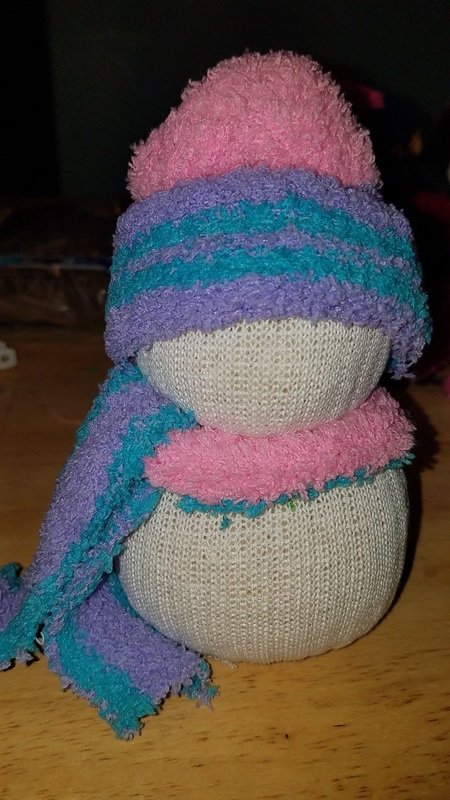 Place your scarf over the head of your snowman. This will be in a ring, but cut the ring open and make one long strip for the scarf. 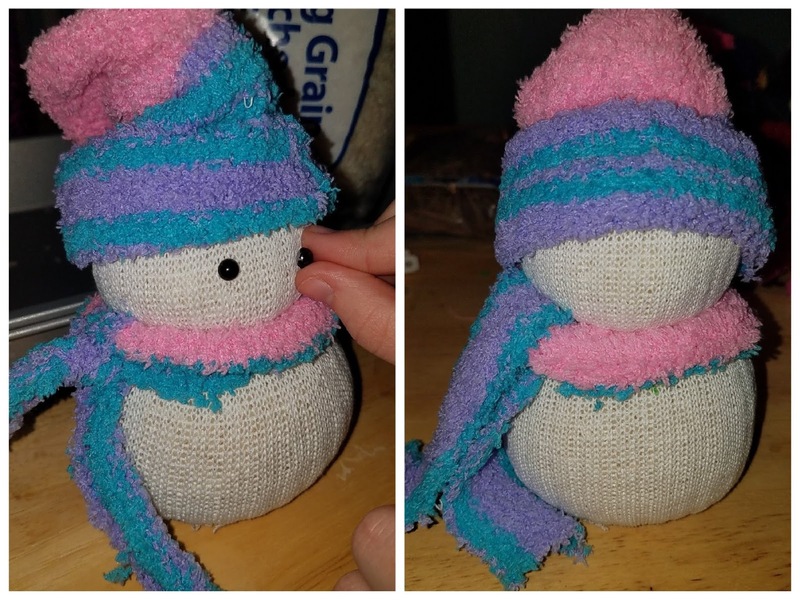 Making this a longer strip will help make the scarf on the snowman look more realistic. 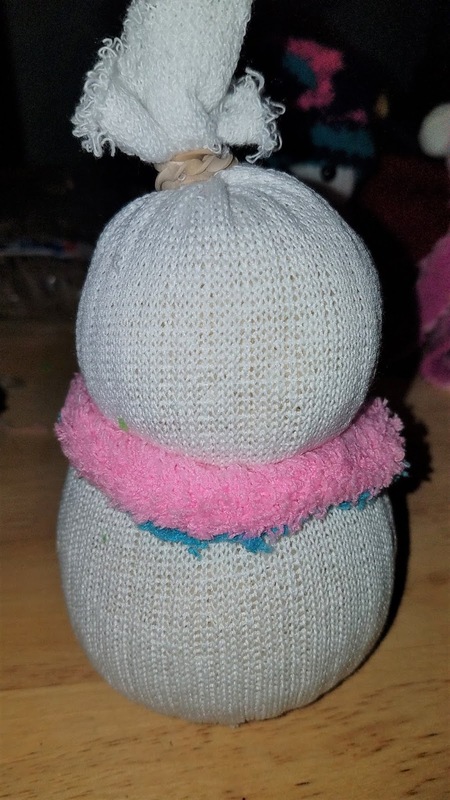 Run this up and over the elastic neck ring to make it look like the snow person has tied their scarf up and the tassels are hanging down. So hat, elastic neck scarf, and longer scarf is tucked up and under the next area. 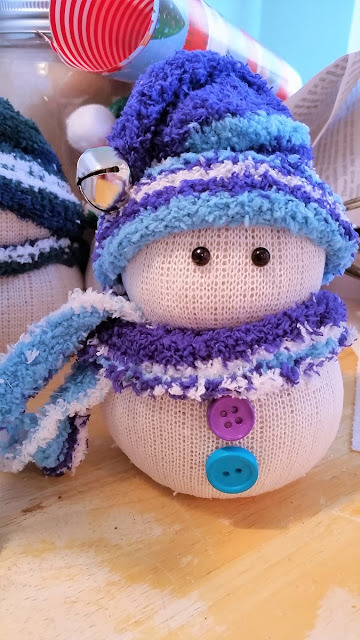 Now you pretty much have a super cute snowman! If the scarf tassels are too long, you can trim them up a bit until they rest near the bottom of the snowman. Here's our guy from last year looking all dapper. You can also choose to tie the loose long scarf piece to the neck scarf for a tied scarf look, or you can leave it flat and wide for a different look. 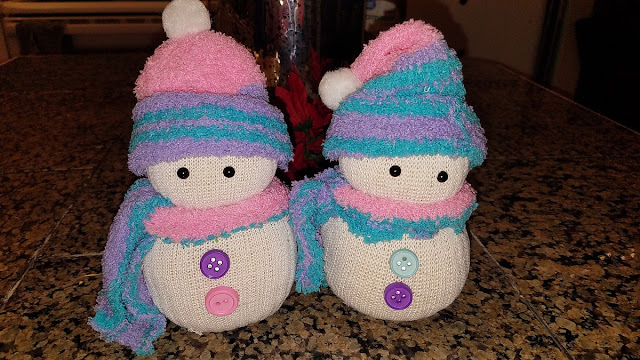 The snowman on the left has a tied knot for his scarf, the one on the right the material is just slipped through the neck one. All we need are some eyes and a few embellishments. 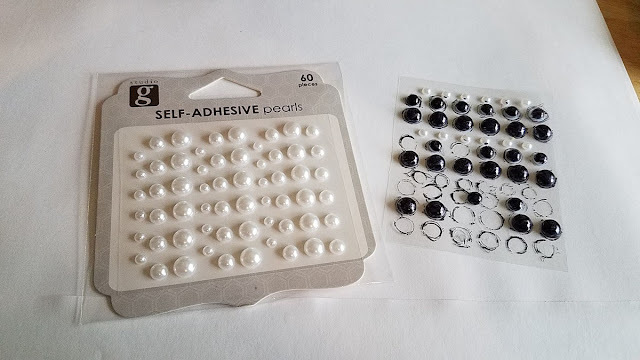 I found these pearl stickers in the craft section of Walmart. The only color they had was pale white, so we just used black sharpies to make them "coal" colored. Stick them on to your snowman's face. These are sort of a stick once and don't touch them again kind of sticker. You really can't move them around because they will lose their stick. Too big of an eye makes them look a little wonky, so test a size out before you stick. 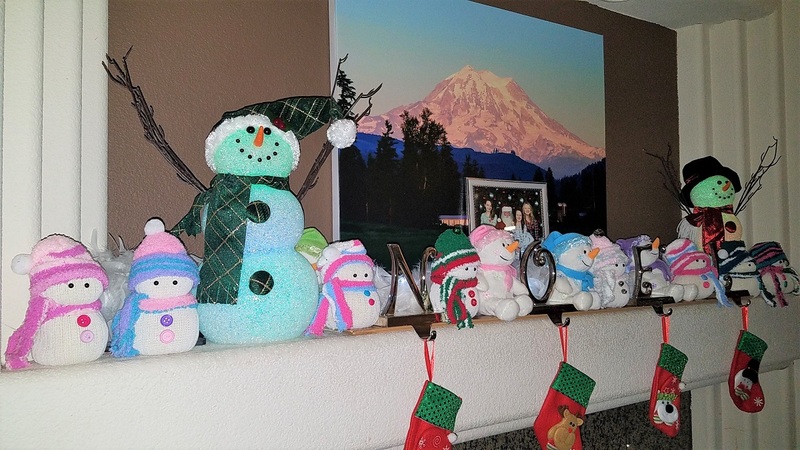 We picked a few coordinating buttons and hot glued them to the snowman's body. My daughters teacher told her she loves blue and purple, so that's the color scheme here. This last part for the hat is optional. The hat does tend to stick straight up, depending on how long it is, and so to make it look more like a floppy Santa/Elf hat, I took a little blob of hot glue and touched the tip of the hat to the side of the hat and held it a few seconds. To cover up the little glue spot, we took some puff balls and/or jingle bells and hot glued them to the top of the hat. Here's a shorter hat with the pom pom straight up, and here's a hat where we glued a little part of the hat over, for another cute look. It really gave them a finishing touch. You can also use jingle bells, pom poms, anything you want. 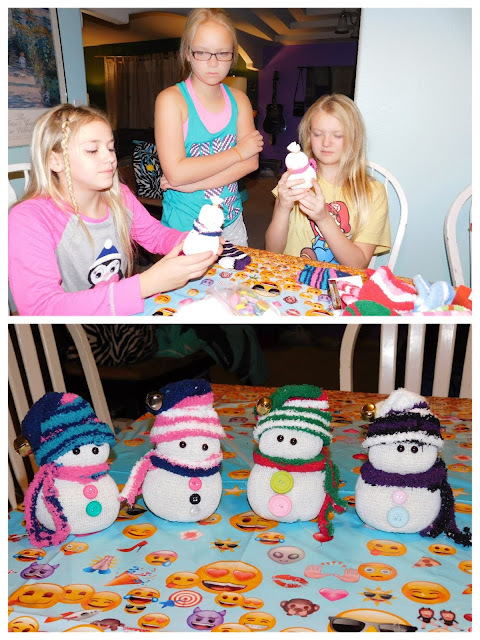 My daughter and friends had a blast making these little guys a few years back as the craft for her sleep over birthday. They loved picking their favorite colors and they all turned out really cute. A fun party craft for kids that are a little older, otherwise you will have rice EVERYWHERE. Also when the girls were making these for their teachers, they picked their teachers' favorite colors or sports team colors. 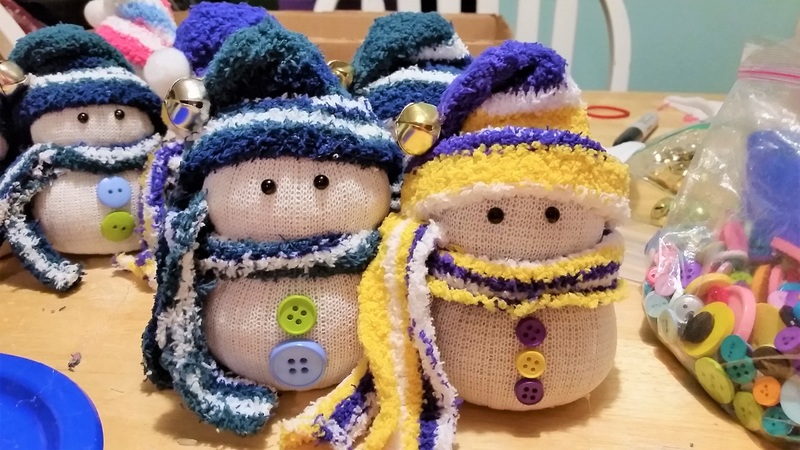 I made a few for my mom in her favorite Seahawks colors and some for my Sis-in-law who's high school colors (she's a teacher) are purple and gold. So fun. Sports team colors for a customized gift... Here are Seahawks, and Sumner Spartan or WA Huskies school colors. The teacher's this year just loved their personalized gifts. The girls had fun designing these little guys to the tastes of the people they were making them for. We even used them to decorate one side of our fireplace mantle, which had a snowman theme this year. We had a blast making these little guys, and it's not too late to make a few for some last minutes gifts for friends and family. Not to mention, if your kids are home on winter break and need something to keep them busy, this little craft could be right up your alley. Let me know if you make any of these and post pictures of how they turned out!